There is no doubt that the choices you make about your wedding day can make a big impact on the financial cost. There is a relatively small fee for marrying in a church (compared to some of your other costs for your wedding day) but as much as we like to help couples to get married, we are also concerned for your long-term well-being and future happiness and we are keen to make sure you don’t start married life with huge financial pressures. Your perfect day need not cost a fortune, but inevitably there will be some expenses. Paying hundreds of pounds in interest for a wedding paid for on credit can severely impact your finances as you begin married lief. So save yourself some stress with this easy 1,2,3. Church fees are just one expense amongst many on a wedding day. Whether you opt for a wedding package or put together your own special day, the costs of a wedding can add up. So set a budget and write it down. Then stick to it to keep costs under control. If you’re looking at options for a photographer, or this menu or that, ask yourselves the question – does this fit our budget? Step 2: work out how much you need to save each month. Be realistic about how much you can afford. For example, for every 1,000 you plan to spend on a wedding in a year’s time, you’ll need to save £80 a month from now on. But if you started saving two years beforehand, you’ll need to save £40 a month. Work it out and start saving. Set up a regular payment to transfer a set amount into a savings account every month. Opening a separate Credit Union account will keep your savings safe and separate from your current account so you’re less tempted to ‘dip in’! Any friends and family could also pay directly into the account if they want to help, and you will have easy access when you need it. Small sacrifices can boost your wedding funds. If your special day is a year away, cut out something today that buy every day. For example, if you save the £2.50 you spend on a coffee each day, you would have 365 x £2.50 = £912.50 more in your wedding fund. 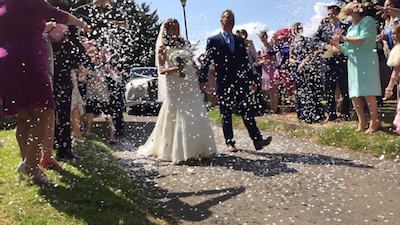 In October 2015, the Diocese of Rochester and Kent Savers Credit Union announced a new partnership to offer savings accounts and loans to couples preparing to marry. Unlike a bank, a credit union’s profits are reinvested in the business or given back to its members as a profit share (a dividend). A credit union is legally obliged to encourage its members to save money.They are also regulated by the Prudential Regulation Authority and all savings are protected under the Financial Services Compensation Scheme. Usually a proportion of a loan repayment is allocated to a savings account, so that once you have repaid your loan, you will have a certain amount saved in your savings account. For example, when you have repaid a typical loan of £1,000, you could have over £200 in your savings account. For our local area, the nearest Credit Union is Kent Savers Credit Union. To join Kent Savers Credit Union in particular, you must be aged 18 or over and live or work within the historical county of Kent – i.e. the area currently administered by Kent County Council, Medway council or the London Borough of Bexley. We have no doubt that you are saving up for your wedding and may have been saving for some time to make the day all that you want it to be. If you save with a credit union, you become a member of the union and are entitled as a member to then borrow from the union. As you borrow, you’re also saving (see above) and the loans are usually at much more preferential rates than you can get on the High Street. So, if you find by your wedding day that there’s a bit of a gap between what you have saved and what you need to pay out, you’re going to have a sensible option available for covering the difference. When you come to meet our Vicar, please do ask him about the Credit Union arrangement. He can provide you with a special voucher that waives the usual membership fee to join the Credit Union. Should you ever borrow to pay for your wedding? If you really can’t afford to pay for a wedding without a loan, at least make sure you get the cheapest interest rate possible and avoid dangerous high cost credit including payday loans. If you have been saving regularly with a Credit Union, then you will be able to apply for one of their affordable low-cost loans to spread the costs of your wedding. Once you’ve been saving regularly, if you need a loan at a later date for something else, your credit records will help show that you can afford repayments, improving your access to affordable finance. What does the church get out of this? St Mary’s receives no financial remuneration or other benefits for recommending Kent Savers Credit Union to you. Likewise, the Diocese of Rochester is not benefitting in any way. All we get out of it is the knowledge that we are helping you to ensure your marriage gets off to the best possible start, including (but not limited to) your finances. However and whenever you choose to get married, you make a public declaration of life-long commitment to love each other faithfully and take on a new legal status as husband and wife. The Church of England believes marriage is good for the well-being of individuals and society. If you have found ‘the one’ and you are committed to each other in every respect, there is such a great adventure ahead. We would be delighted to be part of that adventure too.